Here in New Jersey it is HOT & humid. I wanted to try baking a cake on top of the stove instead of turning on the oven and heating up the whole house. I am happy to announce that I was able to bake a few things on top of the stove with varied levels of success. The Zucchini Bread came out wonderfully. It even browned! The cake texture was perfect and it was moist inside. 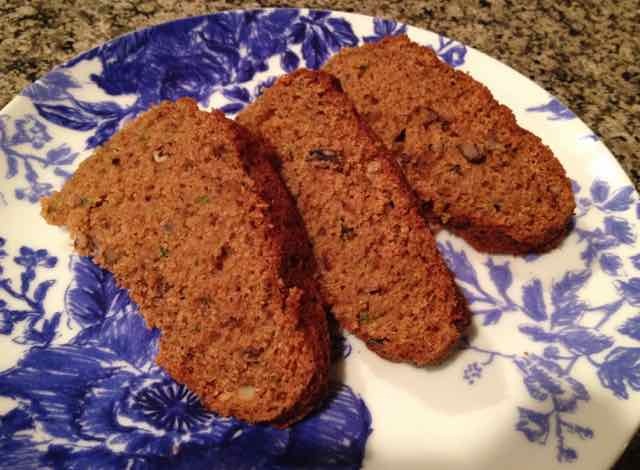 I used a traditional Zucchini Bread recipe from food.com. 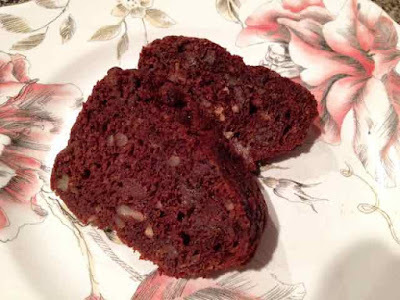 I converted it into a gluten free version and I also cut the recipe in half since I had to use a small pan to bake it. I love the taste of this bread. It is not too sweet and the amount of cinnamon is just right for me. I also tried to make stove top biscuits using a frying pan method. 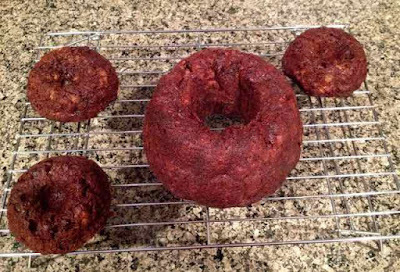 They did not have the correct texture, so next time I will try to bake some using the same method as with the Zucchini Bread. 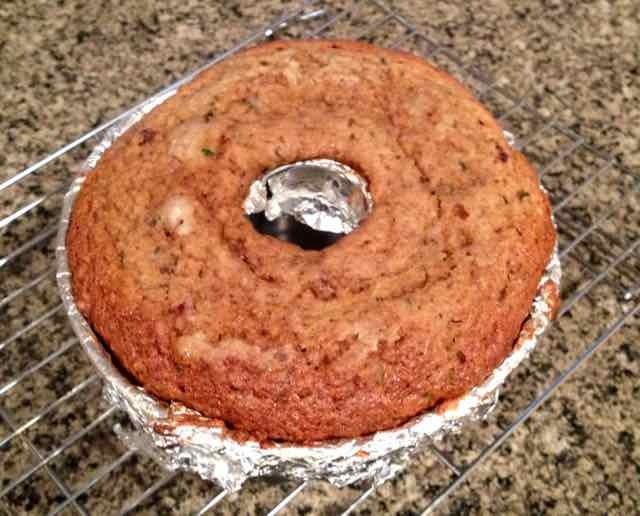 I also baked my Zucchini Quiche recipe with the same method as the Zucchini Bread. The quiche had a great texture, but stuck to the pan and I had to scrape it out with a rubber spatula losing any brown edges. Lesson learned, I lined the pan with foil to make the Zucchini Bread. This worked perfectly. 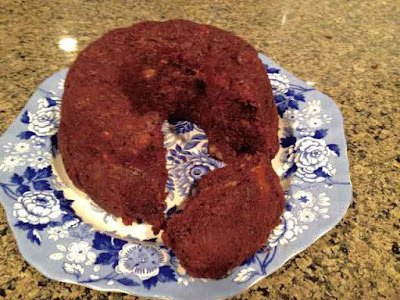 To bake on the stove top I used a round large cast iron pot (10-inches in diameter & 4½-inches deep). 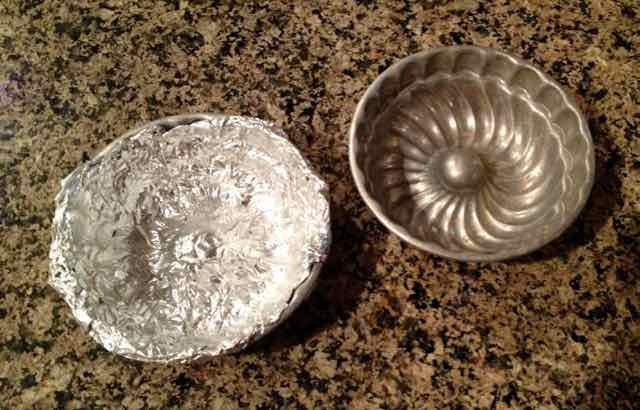 I placed a metal vegetable steamer on the bottom and used a clear glass cover so that I could see what was going on inside. 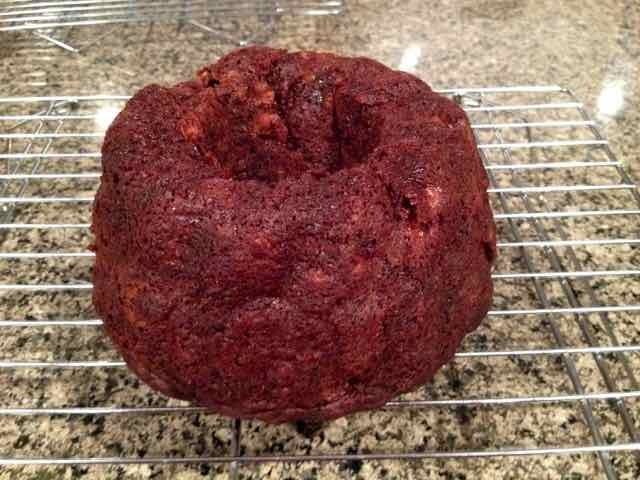 I used a small tube pan (6½-inch) to hold the batter. The heat can get all around the tube pan to bake the cake in the center and also it was the only pan I had that would fit in the pot. If I had a bigger cast iron pot I would have used a bigger pan. 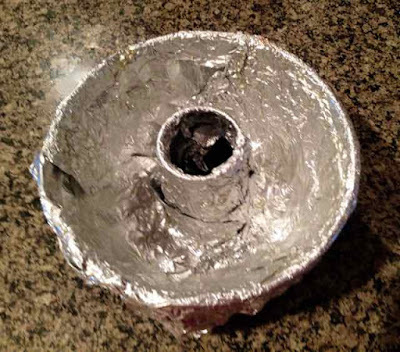 I had looked up recipes and “how to” directions for stove top baking. I found an ad for a special pot that they use on boats to bake. It cost about $60 and you have to do all the baking in the tube pan that comes with it. 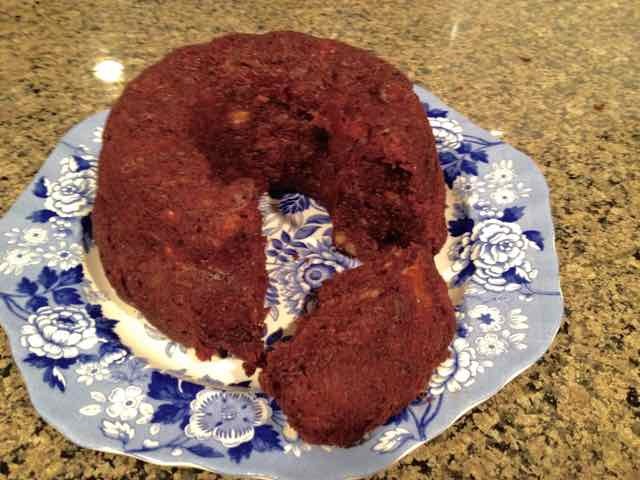 It said that the only problem was that the breads or cakes do not brown. 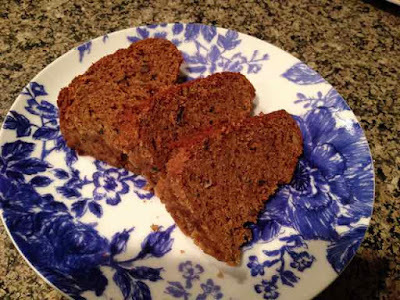 I was delightfully surprised when the sides and top of the Zucchini Bread did get browned. I also found a recipe for a cake that was baked in a pan using an aluminum pot with a rack on the bottom. I decided to use a cast iron pot since they can be heated dry for long periods of time without damaging or breaking them. I have had some thick metal pans warp when used dry on high heat on the barbecue, so I did not want to use and possibly ruin any of my good stainless pots. 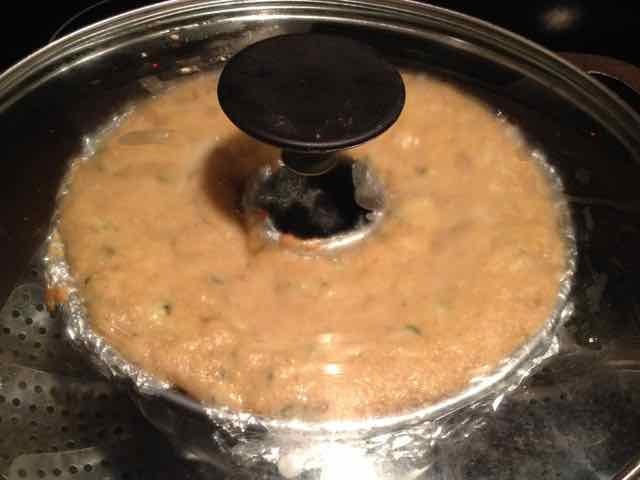 I used the veggie steamer because it would allow the heat to circulate and it fit in the pan. I have an electric stovetop. 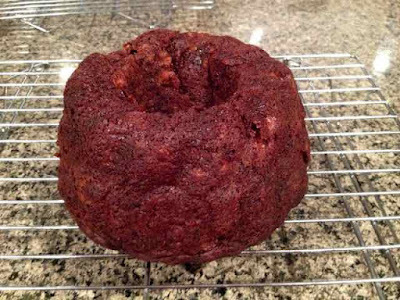 I used a medium setting (on my stove it says medium and is a #5) to heat the pot and steamer for about 10 minutes before putting the cake in to bake. Then after baking at this heat for 10 minutes I turned down the heat to low (#2 on my stove) and baked it another 40 minutes. After the first 40 minutes of baking I pressed the top of the cake to check for doneness and it needed at least ten minutes more. I checked it at the total of 1 hour of baking and felt it could use another 5 minutes, but I forgot to turn on the timer after setting it and it baked about 20 minutes longer instead of 5 minutes longer. It got a bit browner than I would have preferred, I think that if I had stopped the baking after the extra 5 minutes it would have been the perfect golden brown. Still tasted great and did not burn. I think that every stove heats a bit differently so you will have to experiment with the heat settings and timing. Preheating the cast iron pot, 10 minutes on medium heat and then reducing the heat to low (#2 setting) worked on my stove for a 350℉ baking setting. The directions for a gas stove on the website were to preheat the pan on medium low and then turn the heat down to the lowest setting as soon as you put the pan with the batter in the pot. I am so happy that I can bake without turning on the oven! I will keep posting stove top recipes as I experiment. 1) Line the tube pan with foil and grease well. If using a loaf pan you can line it with foil or parchment paper. 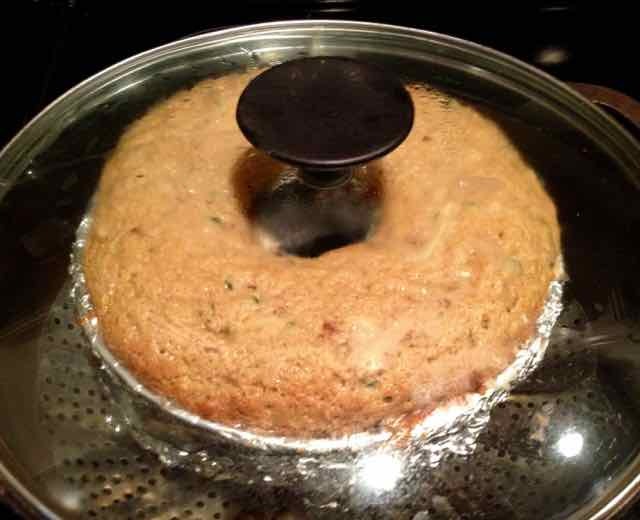 Make sure that any pan you use in stovetop baking will fit into the pot with room around it for the air to circulate and enough space over the top for the cake to rise when the pot is covered. 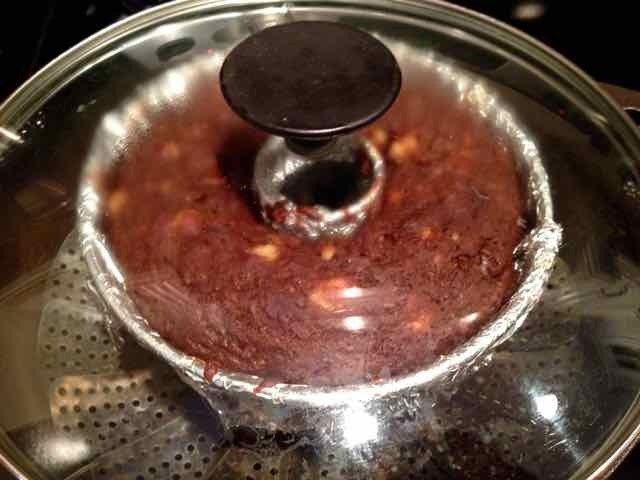 Tube pan lined with strips of foil and then well greased. 2) If baking on top of the stove: Take a large cast iron pot (at least 10” in diameter) and put a rack or a metal vegetable steamer inside on the bottom. Heat the DRY pan, covered, on medium heat for at least 10 minutes while you prepare the batter. If baking the recipe in the oven preheat the oven to 350℉. 3) Add the flours, baking soda, baking powder, sugar, salt, xanthan gum and cinnamon to a large bowl and whisk together until well combined. 4) Add the oil, applesauce, eggs and vanilla and mix until smooth. Wet ingredients added to the bowl with the dry ones. 5) Add the zucchini and stir in. 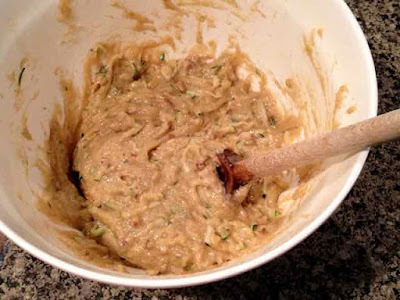 Grated zucchini added to the batter. 6) If using nuts, mix the ½ tsp of tapioca flour with the nuts and then add to the batter. Stir in. Batter all mixed with the nuts and zucchini added. 7) Spoon all the batter into the prepared pan and place the pan on top of the steamer in the preheated pot. Cover. Cook for 10 minutes at medium heat (on my electric stove it is #5) then lower the heat to low (#2 on my electric stove). 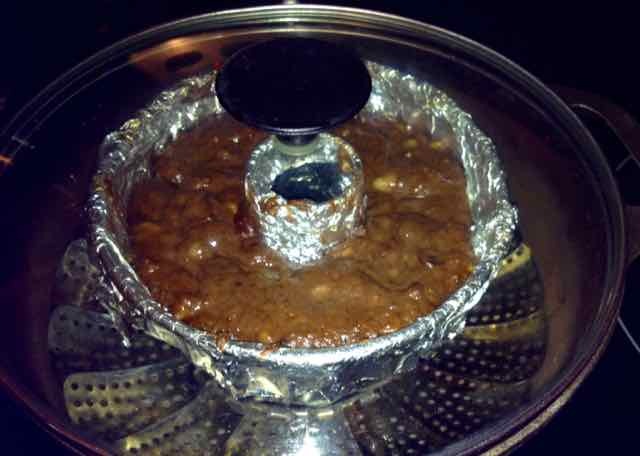 Cook for a total of 1 hour or until the top is done and springs back when pressed with a finger. Or until a wooden toothpick comes out clean. If baking in an oven bake for 1 hour or until the center springs back when pressed with a finger or a wooden toothpick comes out clean. 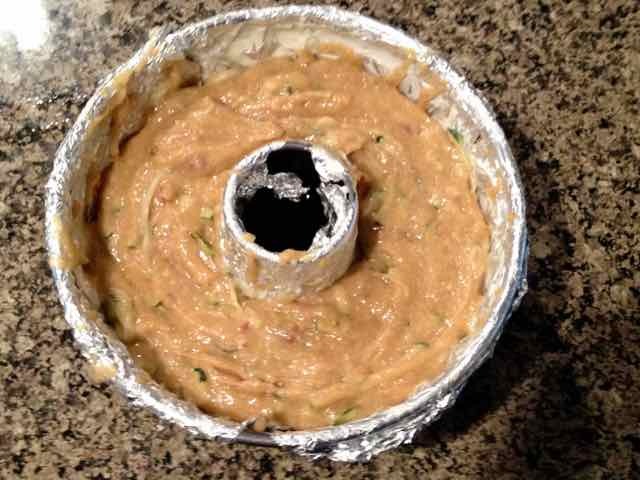 Raw batter in the prepared pan. Tube pan in the pot after about 10 minutes of stovetop "baking". The tube pan is resting on a metal steamer which is on the bottom of a cast iron pot. 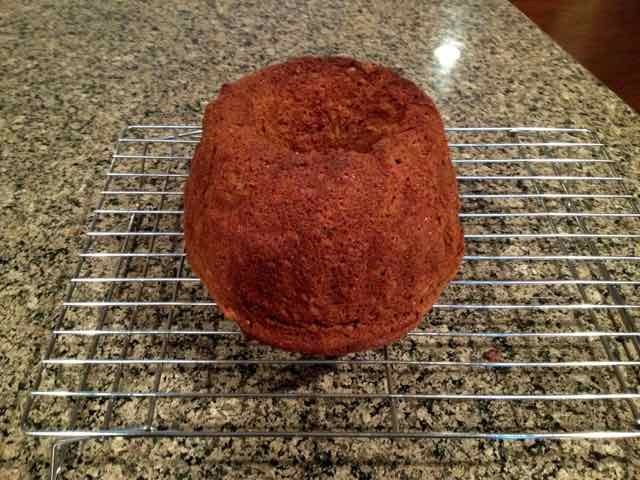 The pot is kept covered the entire time it "bakes". The batter keeps rising as it bakes. This is as high as the batter rose. It fell a bit after cooling down. 8) Cool on a rack for 10 minutes and then invert the cake out of the pan onto the rack to cool completely. 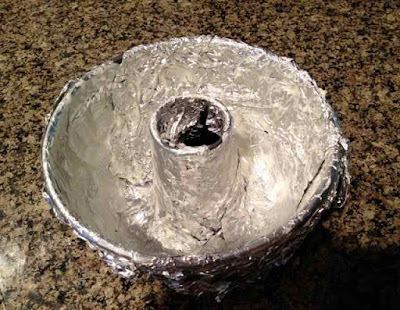 Peel the foil off the cake while still very warm or it will stick and peel off some of the outside of the cake. 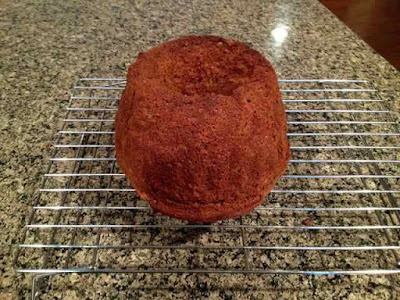 Cake cooling on a rack after it has finished baking. Cake turned out onto the rack. Zucchini Bread after the foil was taken off. it will not stick and peel off some of the outside of the cake. Zucchini Bread with some slices taken out. 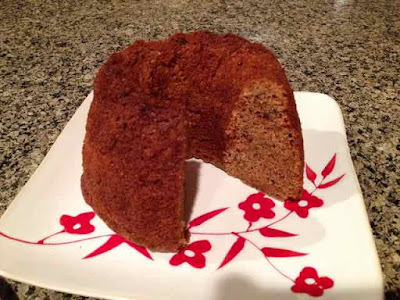 GLUTEN FREE DAIRY FREE ZUCCHINI BREAD Makes one 8½” x4½” loaf or one 6½ “ tube pan cake INGREDIENTS ¾ cup Sorghum Flour ¼ cup Tapioca Flour ¼ cup Chickpea Flour ¼ cup Coconut Flour ½ tsp Xanthan Gum ½ tsp Sea Salt 1 tsp Baking Soda ¼ tsp Baking Powder ¾ tsp Cinnamon 1 cup Sugar (I used evaporated cane juice crystals) 2 large Eggs ¼ cup Oil - light tasting like canola ¼ cup Applesauce (or another ¼ cup of oil) 1½ tsp Vanilla 1 cup Grated Zucchini ¼ cup Chopped Walnuts or Pecans (optional) ½ tsp Tapioca Flour - to coat the nuts in (omit if not adding nuts) DIRECTIONS 1) Line the tube pan with foil and grease well. If using a loaf pan you can line it with foil or parchment paper. Make sure that any pan you use in stovetop baking will fit into the pot with room around it for the air to circulate and enough space over the top for the cake to rise when the pot is covered. 2) If baking on top of the stove: Take a large cast iron pot (at least 10” in diameter) and put a rack or a metal vegetable steamer inside on the bottom. 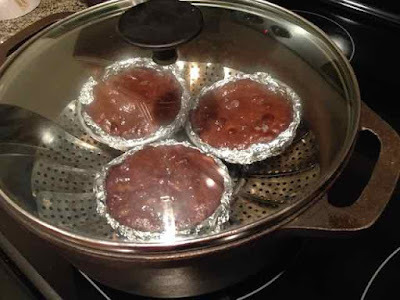 Heat the DRY pan, covered, on medium heat for at least 10 minutes while you prepare the batter. If baking in the oven preheat the oven to 350℉. 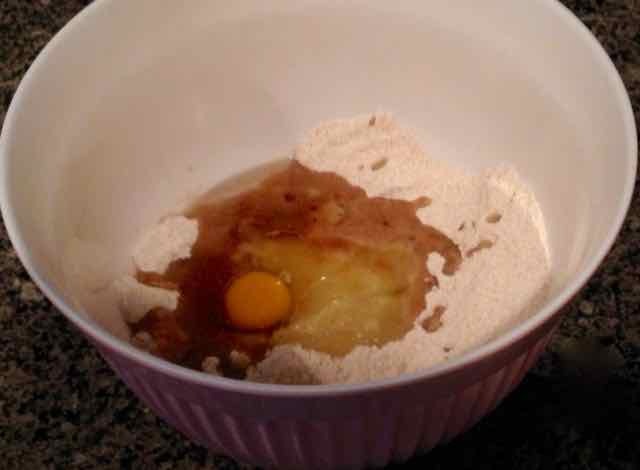 3) Add the flours, baking soda, baking powder, sugar, salt, xanthan gum and cinnamon to a large bowl and whisk together until well combined. 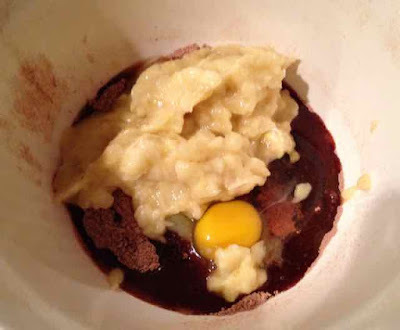 4) Add the oil, applesauce, eggs and vanilla and mix until smooth. 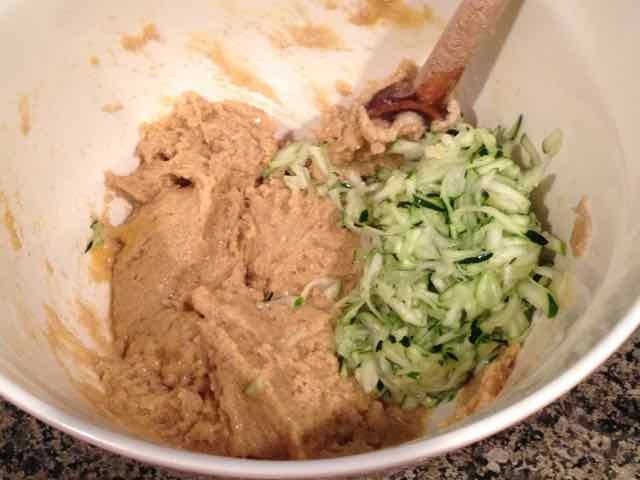 5) Add the zucchini and stir in. 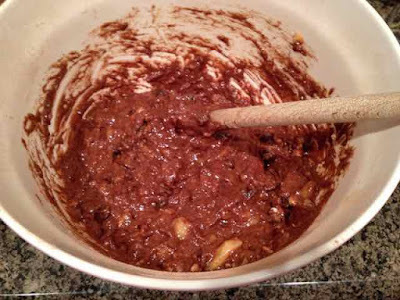 6) If using nuts, mix the ½ tsp of tapioca flour with the nuts and then add to the batter. Stir in. 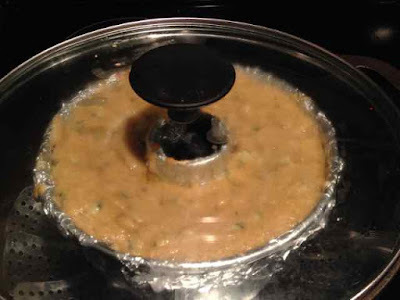 7) Spoon the batter into the prepared pan and place the pan on top of the steamer in the preheated pot. Cover. Cook for 10 minutes at medium heat (on my electric stove it is #5) then lower the heat to low (#2 on my electric stove). Cook for a total of 1 hour or until the top is done and springs back when pressed with a finger. Or until a wooden toothpick comes out clean. If baking in an oven, bake for 1 hour or until the center springs back when pressed with a finger or a wooden toothpick comes out clean. 8) Cool on a rack for 10 minutes and then invert the cake out of the pan onto the rack to cool completely. 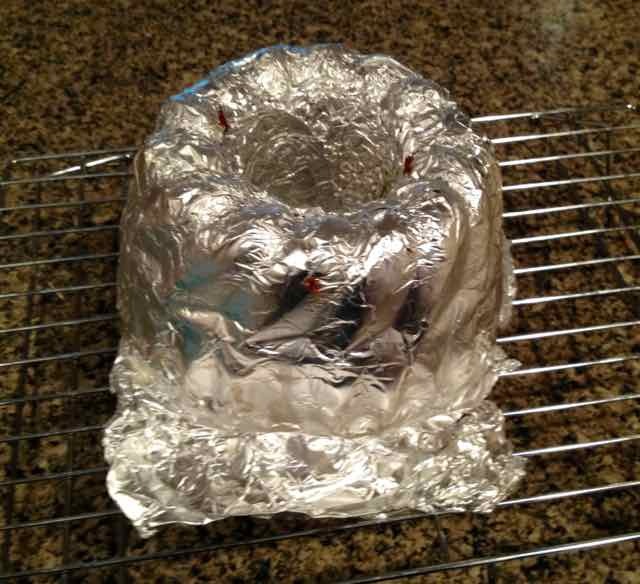 Peel the foil off the cake while still very warm or it will stick and peel off some of the outside of the cake.